Wycombe have arrested a worrying end to 2018 in excellent fashion. Although December started impressively with a 1-0 win over promotion-chasing Barnsley to make it three triumphs on the bounce, plus a 2-2 draw at Gillingham that followed, it soon went downhill rapidly. A surprising 2-1 home defeat to AFC Wimbledon was next, while Wycombe then lost 3-1 at Burton, before going down 1-0 at Scunthorpe, suffering a trio of defeats. The new year didn’t begin much better, beaten 2-0 in front of their own fans by Coventry, before an 11-day break provided the perfect respite for Gareth Ainsworth’s side. They saw off Doncaster Rovers 3-2 and then enjoyed single goal wins against both Bristol Rovers and Plymouth Argyle to make it three victories in a row. That is enough to ensure they should be looking up rather than down going into the final 15 games of the season, as they sit ninth, 11 points away from the bottom four and just six adrift of the final play-off spot. However, boss Ainsworth will continue to keep an eye over his shoulder, saying: “I am still looking at Wycombe being part of a 16-team relegation battle. “Two or three results going either way and you can soon worry about where you are in the table. Away from home it’s been a struggle at times for the Chairboys this term, three wins on the road, six draws and six defeats, scoring 19 and shipping 25. After beating Bradford at Valley Parade in August, it took them three months to pick up another three points, defeating Accrington during November. They did also emerge from Bristol Rovers victorious last month, and are now two unbeaten on the road, holding Blackpool to a 2-2 draw at Bloomfield Road as well. It was a fairly quiet deadline day at Adams Park, with Wycombe just bringing in QPR’s Northern Ireland U21 international midfielder Charlie Owens, 21, on loan for the rest of the season. That was on top of Manchester City’s Luke Bolton arriving earlier in the window, as leaving the club was ex-Hatter Craig Mackail-Smith, who joined League Two strugglers Notts County. Team news: Luton will be without both Harry Cornick and Elliot Lee as they are expected to be fit for next week’s trip to Fleetwood. 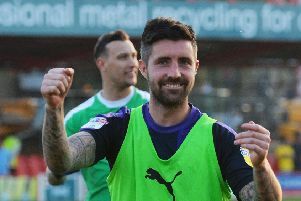 Goalkeeper Marek Stech remains a doubt, with Brighton loanee Aaron Connolly has not recovered from his hamstring injury yet, Glen Rea out for the season too. Wycombe striker Alex Samuel went off injured against Bradford last week, while Darius Charles and Yves Ma-Kalambay remain sidelined, as midfielder Sam Saunders left the club recently. Top scorers: Hatters: James Collins (18). Wanderers: Adebayo Akinfenwa (6). Milestones: Town full back James Justin will make his 100th appearance for the club if selected this weekend. The 20-year-old made his debut as a substitute replacing Stephen O’Donnell against Exeter in May 2016. Was handed his first start the following campaign, playing in the 3-1 Carabao Cup win over Aston Villa and has gone on to score six goals in that time. Meanwhile, Luton will equal a club record of 19 Football League games unbeaten set in the 1967-68 season, if they can avoid defeat at the weekend. Man in the middle: Andy Davies - Officiated most of the season in the Championship, showing 84 yellows and six reds in 25 games, with five of his dismissals coming in the space of three matches. Has taken one Luton game already, the 2-0 win at AFC Wimbledon back in October, while refereed Hatters once in the 2016-17 season, the 2-0 win over West Brom U21s in the Checkatrade Trophy. Also had the 2-1 win against Hartlepool the year before when Craig Mackail-Smith scored a late winner, plus a 3-1 win over Dagenham & Redbridge in October 2014, Mark Cullen getting a hat-trick. Assistant referees are Darren Blunden and Daniel Leach, with the fourth official Sam Purkiss. In charge: Gareth Ainsworth - 45-year-old, who had a successful playing career at the likes of Blackburn Rovers, Northwich Victoria, Preston North End, Cambridge United, Lincoln City and Port Vale, who paid £500,000 in 1997. Earned a move to the Premier League when he joined Wimbledon for £2million a year later, before a switch to Cardiff in 2003 and then QPR where he spent seven years, twice serving as caretaker-manager. Joined Wycombe in February 2010 and was appointed player manager in November 2012 following the sacking of Gary Waddock, while he is now the second longest serving manager in English football, behind Morecambe’s Jim Bentley. View from the dug out: Gareth Ainsworth: “We have upset the form books in the past and stopped records happening and have broken records. “They have an unbeaten home record and it would be great to be able to dent that. “In the FA Cup game there in November we were second best and we didn’t have the firepower to get anything at the other end. “We have to learn from that and we are looking at how we can be better. “This is going to be a very tough game and we will be billing it as the hardest game so far of the year. Played for both: Mike Keen. Started his career at Queens Park Rangers, making his debut in 1959 and went on to play 393 league games for the club, scoring 39 goals, captaining the side to the League Cup victory and Third Division Championship in 1966–67. Moved to Luton in 1969, staying for three years, making 160 appearances and scoring 11 goals, until he was transferred to Watford. Appointed player-manager of the Hornets in 1973, sacked in 1977 shortly before a home game with Huddersfield Town, while he took over at Northampton in 1978. Was appointed boss at hometown club Wycombe in January 1980 and led the Wanderers to the semi-final of the FA Trophy in the 1981-82 season and the Isthmian League title the following year. Went on to manage Marlow before opening two sports shops in High Wycombe, until he sadly died after a short illness, aged 69, on April 12, 2009. Wycombe defender Michael Harriman had eight months on loan at Kenilworth Road during the 2014-15 campaign, making 39 appearances, scoring two goals. Rejoined Wycombe for a second spell in July 2015 and has since gone on to play 132 times for the Chairboys, scoring nine times. Striker Craig Mackail-Smith joined Wycombe in the summer of 2017 after being released by the Hatters following an injury-hit two years in which he played 40 times, scoring five goals. Made 61 appearances for the Chairboys, scoring 13 goals, moving to Notts County on deadline day, handed his debut in the 1-1 draw with Lincoln City last week. We’ve got form: The visitors have had the better of things at Kenilworth Road in recent years, with four wins from their previous five league visits. Although Town knocked the Chairboys out of the FA Cup earlier this term, it’s been a different story when points are up for grabs, Danny Hylton’s hat-trick in September 2016 sealing a 4-1 win, their only triumph. Elliot Lee twice netted doubles in 3-2 defeats, while Wanderers also won 2-0 and 1-0 in 2015 and 2009 respectively. Prior to that, Luton had had the better of things, with four wins from seven and just the one defeat since the first clash in April 1997. Overall, it’s neck and neck from the 13 matches, with Luton winning five, Wycombe winning five, the other three finishing all square, as Town have scored 19 and shipped 15. Last time out: Luton ran out 2-0 winners in the Chairboys’ visit to Kenilworth Road earlier this season for an FA Cup first round tie. Town the lead when Andrew Shinnie cut in from the right hand side and beat Ryan Allsop from 25 yards on 41 minutes. Harry Cornick then gave Luton breathing space with 19 minutes to go, taking advantage of an error by Adam El-Abd, sealing Luton’s success. Hatters: James Shea, Jack Stacey, James Justin, Sonny Bradley, Matty Pearson, Glen Rea, Andrew Shinnie (Jorge Grant 52), Pelly-Ruddock Mpanzu, Elliot Lee (Kazenga LuaLua 86), Harry Cornick, James Collins. Subs not used: Marek Stech, Lloyd Jones, Alan Sheehan, Alan McCormack, Aaron Jarvis.